Temple of Aphaia from the southeast. The Temple of Aphaia (Greek: Ναός Αφαίας) or Afea is located within a sanctuary complex dedicated to the goddess Aphaia on the Greek island of Aigina, which lies in the Saronic Gulf. Formerly known as the Temple of Jupiter Panhellenius, the great Doric temple is now recognized as dedicated to the mother-goddess Aphaia. It was a favorite of the neoclassical and romantic artists such as J. M. W. Turner. It stands on a c. 160 m peak on the eastern side of the island approximately 13 km east by road from the main port. Aphaia (Greek Ἀφαία) was a Greek goddess who was worshipped exclusively at this sanctuary. The extant temple of c. 500 BC was built over the remains of an earlier temple of c. 570 BC, which was destroyed by fire c. 510 BC. The elements of this destroyed temple were buried in the infill for the larger, flat terrace of the later temple, and are thus well preserved. Abundant traces of paint remain on many of these buried fragments. There may have been another temple in the 7th century BC, also located on the same site, but it is thought to have been much smaller and simpler in terms of both plan and execution. Significant quantities of Late Bronze Age figurines have been discovered at the site, including proportionally large numbers of female figurines (kourotrophoi), indicating – perhaps – that cult activity at the site was continuous from the 14th century BC, suggesting a Minoan connection for the cult. The last temple is of an unusual plan and is also significant for its pedimental sculptures, which are thought to illustrate the change from Archaic to Early Classical technique. These sculptures are on display in the Glyptothek of Munich, with a number of fragments located in the museums at Aigina and on the site itself. 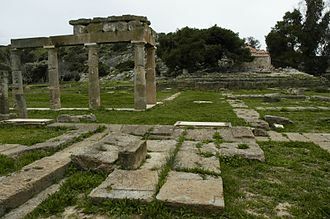 The periegetic writer Pausanias briefly mentions the site in his writings of the 2nd century AD, but does not describe the sanctuary in detail as he does for many others. The temple was made known in Western Europe by the publication of the Antiquities of Ionia (London, 1797). In 1811, the young English architect Charles Robert Cockerell, finishing his education on his academic Grand Tour, and Baron Otto Magnus von Stackelberg removed the fallen fragmentary pediment sculptures. On the recommendation of Baron Carl Haller von Hallerstein, who was also an architect and, moreover, a protégé of the art patron Crown Prince Ludwig of Bavaria, the marbles were shipped abroad and sold the following year to the Crown Prince, soon to be King Ludwig I of Bavaria. Minor excavations of the east peribolos wall were carried out in 1894 during reconstruction of the last temple. Systematic excavations at the site were carried out in the 20th century by the German School in Athens, at first under the direction of Adolf Furtwängler. The area of the sanctuary was defined and studied during these excavations. The area under the last temple could not be excavated, however, because that would have harmed the temple. In addition, significant remains from the Bronze Age were detected in pockets in the rocky surface of the hill. From 1966 to 1979, an extensive second German excavation under Dieter Ohly was performed, leading to the discovery in 1969 of substantial remains of the older Archaic temple in the fill of the later terrace walls. Ernst-Ludwig Schwandner and Martha Ohly were also associated with this dig, which continued after the death of Dieter Ohly until 1988. Sufficient remains were recovered to allow a complete architectural reconstruction of the structure to be extrapolated; the remains of the entablature and pediment of one end of the older temple have been reconstructed in the on-site museum. The sanctuary of Aphaia was located on the top of a hill c. 160 m in elevation at the northeast point of the island. The last form of the sanctuary covered an area of c. 80 by 80 m; earlier phases were less extensive and less well defined. In its earliest phase of use during the Bronze Age, the eastern area of the hilltop was an unwalled, open-air sanctuary to a female fertility and agricultural deity. Bronze Age figurines outnumber remains of pottery. Open vessel forms are also at an unusually high proportion versus closed vessels. There are no known settlements or burials in the vicinity, arguing against the remains being due to either usage. Large numbers of small pottery chariots and thrones and miniature vessels have been found. Although there are scattered remains dating to the Early Bronze Age such as two seal stones, remains in significant quantities begin to be deposited in the Middle Bronze Age, and the sanctuary has its peak use in the LHIIIa2 through LHIIIb periods. It is less easy to trace the cult through the Sub-Mycenean period and into the Geometric where cult activity is once more reasonably certain. Furtwängler proposes three phases of building at the sanctuary, with the earliest of these demonstrated by an altar at the eastern end dating to c. 700 BC. Also securely known are a cistern at the northeast extremity and a structure identified as a treasury east of the propylon (entrance) of the sanctuary. The temple corresponding to these structures is proposed to be under the later temples and thus not able to be excavated. Furtwängler suggests that this temple is the oikos (house) referenced in a mid-7th-century BC inscription from the site as having been built by a priest for Aphaia; he hypothesizes that this house of the goddess (temple) was built of stone socles topped with mud brick upper walls and wooden entablature. The top of the hill was slightly modified to make it more level by wedging stones into the crevices of the rock. Reconstructed entablature and pediment of the Temple of Aphaia I in the on-site museum. Ohly detected a (stone socle and mudbrick upper level) peribolos wall enclosing an area of c. 40 by 45 m dating to this phase. This peribolos was not aligned to the axis of the temple. A raised and paved platform was built to connect the temple to the altar. There was a propylon (formal entrance gate) with a wooden superstructure in the southeast side of the peribolos. A 14 m tall column topped by a sphinx was at the northeast side of the sanctuary. The full study and reconstruction of the temple was done by Schwandner, who dates it to before 570 BC. In his reconstruction, the temple is prostyle-tetrastyle in plan, and has a pronaos and – significantly – an adyton at the back of the cella. As is the case at the temples of Artemis at Brauron and Aulis (among others), many temples of Artemis have such back rooms, which may indicate a similarity of cult practice. The cella of the temple of Aphaia had the unusual feature of having two rows of two columns supporting another level of columns that reached the roof. The architrave of this temple was constructed in two courses, giving it a height of 1.19 m versus the frieze height of 0.815 m; this proportion is unusual among temples of the region, but is known from temples in Sicily. A triglyph and metope frieze is also placed along the inside of the pronaos. These metopes were apparently undecorated with sculpture, and there is no evidence of pedimental sculptural groups. This temple and much of the sanctuary was destroyed by fire around 510 BC. View east from the opisthodomos of the Temple of Aphaia II showing the colonnades of the cella. Construction of a new temple commenced soon after the destruction of the older temple. The remains of the destroyed temple were removed from the site of the new temple and used to fill a c. 40 by 80 m terrace within the overall sanctuary of c. 80 by 80 m. This new temple terrace was aligned on north, west, and south with the plan of the new temple. The temple was a hexastyle peripteral Doric order structure on a 6 by 12 column plan resting on a 15.5 by 30.5 m platform; it had a distyle in antis cella with an opisthodomos and a pronaos. All but three of the outer columns were monolithic. There was a small, off-axis doorway between the cella and the opisthodomos. In similar design but more monumental execution than the earlier temple, the cella of the new temple had two rows of five columns, supporting another level of columns that reached to roof. The corners of the roof were decorated with sphinx acroteria, and the central, vegetal acroterion of each side had a pair of kore statues standing one on either side, an unusual feature. The antefixes were of marble, as were the roof tiles. Doric frieze and horizontal geisa of the Temple of Aphaia II showing slotted triglyphs. Bankel says the temple of Aphaia is more developed than the earlier phase of this structure, giving it a date of around 500 BC. The metopes of this temple, which were not found, were slotted into the triglyph blocks and attached to backer blocks with swallowtail clamps. If they were wooden, their lack of preservation is to be expected. If they were stone, then they may have been removed for the ancient antiquities market while the structure was still standing. The altar was redone for this phase as well. If still in use by the 4th-century, the temple would have been closed during the persecution of pagans in the late Roman Empire. Sculpture of a warrior from the east pediment of the Temple of Aphaia II. The marbles from the Late Archaic temple of Aphaia, comprising the sculptural groups of the east and west pediments of the temple, are on display in the Glyptothek of Munich, where they were restored by the Danish neoclassic sculptor Bertel Thorvaldsen. These works exerted a formative influence on the local character of Neoclassicism in Munich, as exhibited in the architecture of Leo von Klenze. Each pediment centered on the figure of Athena, with groups of combatants, fallen warriors, and arms filling the decreasing angles of the pediments. The theme shared by the pediments was the greatness of Aigina as shown by the exploits of its local heroes in the two Trojan wars, one led by Heracles against Laomedon and a second led by Agamemnon against Priam. 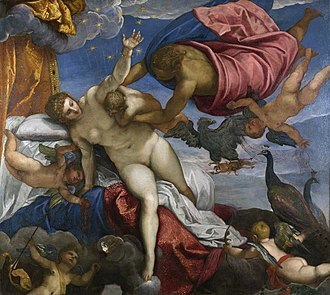 According to the standard myths, Zeus raped the nymph Aigina, who bore the first king of the island, Aiakos. This king had the sons Telamon (father of the Homeric hero Ajax) and Peleus (father of the Homeric hero Achilles). The Greek idolize heroes who fallen at war, to die on the battleground was a great honor it depicted courage and strength. When a hero died it was though that they become immortal because they prove themselves to the Gods. The sculptures preserve extensive traces of a complex paint scheme, and are crucial for the study of painting on ancient sculpture. The marbles are finished even on the back surfaces of the figures, despite the fact that these faced the pediment and were thus not visible. Sculpture of a warrior from the west pediment of the Temple of Aphaia II. Ohly had contended that there were four total pedimental groups (two complete sets of pediments for the east and west sides of the temple); Bankel uses the architectural remains of the temple to argue that there were only three pedimental groups; later in his life, Ohly came to believe that there were only two, which was shown persuasively by Eschbach. There were shallow cuttings and many dowels used to secure the plinths of the sculptures of the west pediment (the back of the temple). The east pediment used deep cuttings and fewer dowels to secure the plinths of the statues. There were also a number of geison blocks that had shallow cuttings and many dowels like the west pediment, but that did not fit there. Bankel argues that sculptures were set on both the east and the west pediments with these shallow cuttings, but that the sculptures of the east pediment were removed (along with the geison blocks cut to receive them) and replaced with a different sculptural group. This replacement appears to have been carried out before the raking geisa were installed on the east pediment, since the corner geisa were not cut down to join to the raking geisa: i.e. the 1st phase of the east pediment was replaced with the 2nd phase before that end of the temple was completed. As the eastern facade of the temple (the front) was the most important visually, it is not surprising that the builders would choose to focus additional efforts on it. The first Trojan war, not the one described by Homer but the war of Heracles against the king of Troy Laomedon is the theme, with Telamon figuring prominently as he fights alongside Heracles against king Laomedon. This pediment is thought to be later than the west pediment and to show a number of features appropriate to the Classical period: the statues show a dynamic posture especially in the case of Athena, chiastic composition, and intricate filling of the space using the legs of fallen combatants to fill the difficult decreasing angles of the pediment. Part of the eastern pediment was destroyed during the Persian Wars, possibly by a thunderbolt. The statues that survived were set up in the sanctuary enclosure, and those that were destroyed, were buried according to the ancient custom. 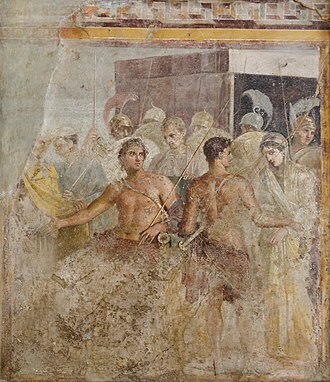 The old composition was replaced by a new one with a scene of a battle, again with Athena at the center. 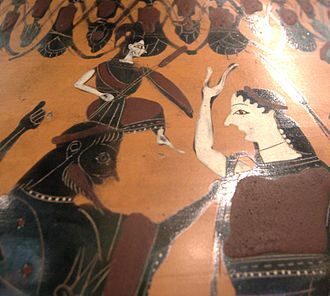 The second Trojan war – the one described by Homer – is the theme, with Ajax (son of Telamon) figuring prominently. 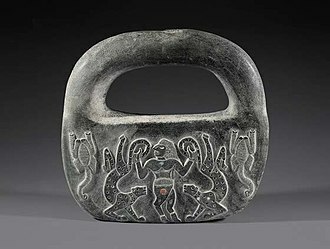 The style of these sculptures is that of the Archaic period. The composition deals with the decreasing angles of the pediment by filling the space using a shield and a helmet. ^ The name Afea appears on all the local signs, Afea being the name of a Cretan woman of unsurpassed beauty. After escaping an unwelcome marriage on Crete, she was rescued by a fisherman from Aegina. In payment for this he also proposed an unwelcome marriage. So Afea headed out of Aghia Marina towards the mountain top where she vanished at the current site of the temple, where it is said that the fisherman established a shrine believing Afea to have been taken by the gods. ^ The main port and the main city are named Aigina, after the island. The Temple of Aphaia is 9.6 km east of this city. The sanctuary is also 29.5 km southwest of the Acropolis of Athens, which is visible across the gulf on a clear day. ^ a b Pilafidis-Williams argues that the character and relative proportions of the finds leads to the conclusion that the deity worshiped was a female fertility/agricultural goddess. ^ The important Bronze Age archaeological site of Kolona is northwest of Aigina (the main city) along the coast, and a museum is located at this site. The museum at Aigina was the first institution of its kind in Greece, but most of the collection (other than a collection of bas relief panels from Delos) was transferred to Athens in 1834 (EB), where it can be seen in the National Archaeological Museum of Athens. The museum on the site contains a restoration of the Early Archaic temple entablature and pediment, as well as copies of elements of the pedimental sculpture of the Late Archaic temple set into restored sections of the pediment. On Aigina as one goes toward the mountain of Pan-Greek Zeus, the sanctuary of Aphaia comes up, for whom Pindar composed an ode at the behest of the Aeginetans. The Cretans say (the myths about her are native to Crete) that Euboulos was the son of Karmanor, who purified Apollo of the killing of the Python, and they say that Britomaris was the daughter of Zeus and Karme (the daughter of this Euboulos). She enjoyed races and hunts and was particularly dear to Artemis. While fleeing from Minos, who lusted after her, she cast herself into nets cast for a catch of fish. Artemis made her a goddess, and not only the Cretans but also the Aeginetans reverence her. The Aeginetans say that Britomaris showed herself to them on their island. Her epithet among the Aeginetans is Aphaia, and it is Diktynna on Crete. ^ "East and West Pediments, Temple of Aphaia, Aegina". smARThistory at Khan Academy. Retrieved December 17, 2012. ^ Ohly disputes that there is sufficient evidence for this oikos structure. ^ Hollinshead disputes that there is sufficient evidence for the presence of an adyton in this temple, and she questions whether similarity of form among temples of Artemis must indicate similarity of cult practice. This feature was not retained in the late Archaic temple, so its centrality to the cult practice is open to question. ^ Schwandner wants this placement to refute the idea that triglyphs are meant to represent the ends of wooden beams. ^ The use of the 6 by 12 plan of the Late Archaic period soon gave way to the Classical period preference for the proportions of the 6 by 13 plan and similar. ^ Bankel notes that c. 80% of the triglyph blocks were damaged in a manner consistent with intentional breakage to remove the metopes. ^ Spivey, Nigel (2012). Greek sculpture. Cambridge [u.a. ]: Cambridge Univ. Press. ISBN 978-0521756983. ^ N. Eschbach, Die archaische Form in nacharchaischer Zeit: Untersuchungen zu Phänomenen der archaistischen Plastik des 5. und 4. Jhs. v. Chr.” Unpublished Habilitationschrift, University of Giessen. ^ Leaflet "The Sanctuary of Aphaia on Aegina", Greek Ministry of Culture, Archaeological Receipts Fund, Athens 1998. Bankel, Hansgeorg. 1993. Der spätarchaische Tempel der Aphaia auf Aegina. Denkmäler antiker Architektur 19. Berlin; New York: W. de Gruyter. ISBN 9783110128086. Cartledge, Paul, Ed., 2002. The Cambridge Illustrated History of Ancient Greece, Cambridge University Press, p. 273. Diebold, William J. 1995. "The Politics of Derestoration: The Aegina Pediments and the German Confrontation with the Past." Art Journal, 54, no2 pp. 60–66. Furtwängler, Adolf, Ernst R. Fiechter and Hermann Thiersch. 1906. Aegina, das Heiligthum der Aphaia. München: Verlag der K. B. Akademie der wissenschaften in Kommission des G. Franz’schen Verlags (J. Roth). Furtwängler, Adolf. 1906. Die Aegineten der Glyptothek König Ludwigs I, nach den Resultaten der neuen Bayerischen Ausgrabung. München: Glyptothek: in Kommission bei A. Buchholz. Glancey, Jonathan, Architecture, Doring Kindersley, Ltd.:2006, p. 96. Invernizzi, Antonio. 1965. I frontoni del Tempio di Aphaia ad Egina. Torino: Giappichelli. Ohly, Dieter. 1977. Tempel und Heiligtum der Aphaia auf Ägina. München: Beck. Schildt, Arthur. Die Giebelgruppen von Aegina. Leipzig : [H. Meyer], 1895. Schwandner, Ernst-Ludwig. 1985. Der ältere Porostempel der Aphaia auf Aegina. Berlin: W. de Gruyter. ISBN 9783110102796. Webster, T. B. L. 1931. "The Temple of Aphaia at Aegina," Journal of Hellenic Studies, 51: 2, pp. 179–183. Wikimedia Commons has media related to Temple of Aphaia. Wikisource has the text of the 1911 Encyclopædia Britannica article Aegina. 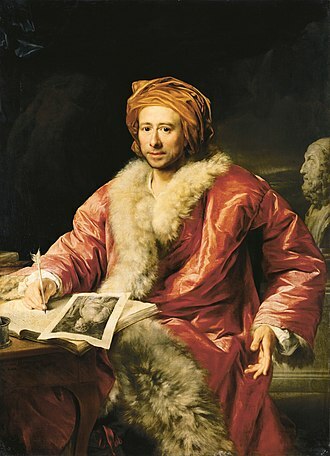 Ferdinand Pajor, "Cockerell and the 'Grand Tour'"
Leo von Klenze was a German neoclassicist architect and writer. Court architect of Bavarian King Ludwig I, Leo von Klenze was one of the most prominent representatives of Greek revival style. Von Klenze studied architecture and public building finance under Friedrich Gilly in Berlin, between 1808 and 1813 he was a court architect of Jérôme Bonaparte, King of Westphalia. Later he moved to Bavaria and in 1816 began to work as architect of Ludwig I. The Kings passion for Hellenism shaped the style of von Klenze. He built many buildings in Munich, including the Ruhmeshalle. On Königsplatz he designed probably the best known modern Hellenistic architectural ensemble, near Regensburg he built the Walhalla temple, named after Valhalla, the home of gods in Norse mythology. When Greece won its independence, Ludwig Is son Otto became the countrys first king, von Klenze was invited to Athens to submit plans of city reconstruction in the style of Ancient Greece. 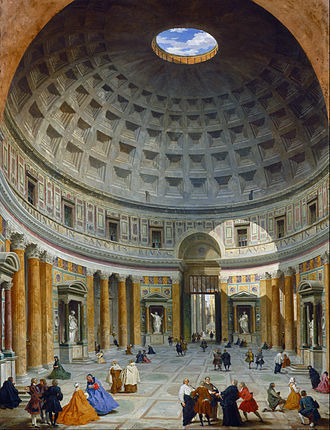 Von Klenze was not only an architect, but an accomplished painter, in many of his paintings ancient buildings were depicted. Classical Greece was a period of around 200 years in Greek culture. This Classical period saw the annexation of much of modern-day Greece by the Persian Empire, Classical Greece had a powerful influence on the Roman Empire and on the foundations of western civilization. Much of modern Western politics, artistic thought, scientific thought, literature, in the context of the art and culture of Ancient Greece, the Classical period, sometimes called the Hellenic period, corresponds to most of the 5th and 4th centuries BC. The Classical period in this sense follows the Archaic period and is in turn succeeded by the Hellenistic period and this century is essentially studied from the Athenian outlook because Athens has left us more narratives and other written works than the other ancient Greek states. 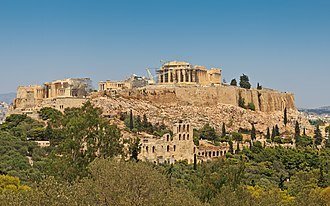 From the perspective of Athenian culture in Classical Greece, the period referred to as the 5th century BC extends slightly into the 4th century BC. In this context, one might consider that the first significant event of this occurs in 508 BC, with the fall of the last Athenian tyrant. However, a view of the whole Greek world might place its beginning at the Ionian Revolt of 500 BC. The Persians were defeated in 490 BC, the Delian League formed, under Athenian hegemony and as Athens instrument. 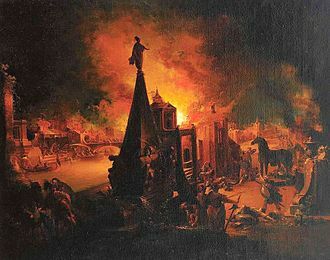 Athens excesses caused several revolts among the cities, all of which were put down by force. After both forces were spent, a brief peace came about, the war resumed to Spartas advantage, Athens was definitively defeated in 404 BC, and internal Athenian agitations mark the end of the 5th century BC in Greece. Since its beginning, Sparta had been ruled by a diarchy and this meant that Sparta had two kings ruling concurrently throughout its entire history. The two kingships were both hereditary, vested in the Agiad dynasty and the Eurypontid dynasty, according to legend, the respective hereditary lines of these two dynasties sprang from Eurysthenes and Procles, twin descendants of Hercules. They were said to have conquered Sparta two generations after the Trojan War, in 510 BC, Spartan troops helped the Athenians overthrow their king, the tyrant Hippias, son of Peisistratos. Geison is an architectural term of relevance particularly to ancient Greek and Roman buildings, as well as archaeological publications of the same. The upper edge of the exterior often had an edge formed as a hawksbeak molding to shed water, there were typically elaborate moldings or other decorative elements. Above the geison ran the sima, the underside of the geison may be referred to as a soffit. The form of a geison is often used as one element of the argument for the chronology of its building. The horizontal geison runs around the perimeter of a Greek temple, projecting from the top of the entablature to protect it from the elements. Horizontal geisa may be found in ancient structures that are built according to one of the architectural orders. The horizontal sima ran above the horizontal geison along the sides of a building, acting as a rain gutter and final decoration. In the Doric order, the underside of the horizontal geison is decorated with a series of protruding, rectangular mutules aligned with the triglyphs. It is often considered a period of transition, sometimes even of decadence or degeneration, compared to the enlightenment of the Greek Classical era. The Hellenistic period saw the rise of New Comedy, Alexandrian poetry, the Septuagint, Greek science was advanced by the works of the mathematician Euclid and the polymath Archimedes. The religious sphere expanded to include new gods such as the Greco-Egyptian Serapis, eastern deities such as Attis and Cybele, the Hellenistic period was characterized by a new wave of Greek colonization which established Greek cities and kingdoms in Asia and Africa. This resulted in the export of Greek culture and language to new realms. Equally, these new kingdoms were influenced by the cultures, adopting local practices where beneficial, necessary. Hellenistic culture thus represents a fusion of the Ancient Greek world with that of the Near East, Middle East and this mixture gave rise to a common Attic-based Greek dialect, known as Koine Greek, which became the lingua franca through the Hellenistic world. Scholars and historians are divided as to what event signals the end of the Hellenistic era, Hellenistic is distinguished from Hellenic in that the first encompasses the entire sphere of direct ancient Greek influence, while the latter refers to Greece itself. The word originated from the German term hellenistisch, from Ancient Greek Ἑλληνιστής, from Ἑλλάς, Hellenistic is a modern word and a 19th-century concept, the idea of a Hellenistic period did not exist in Ancient Greece. Although words related in form or meaning, e. g, the major issue with the term Hellenistic lies in its convenience, as the spread of Greek culture was not the generalized phenomenon that the term implies. Some areas of the world were more affected by Greek influences than others. The Greek population and the population did not always mix, the Greeks moved and brought their own culture. While a few fragments exist, there is no surviving historical work which dates to the hundred years following Alexanders death. The works of the major Hellenistic historians Hieronymus of Cardia, Duris of Samos, the earliest and most credible surviving source for the Hellenistic period is Polybius of Megalopolis, a statesman of the Achaean League until 168 BC when he was forced to go to Rome as a hostage. The persecution of pagans in the late Roman Empire began late during the reign of Constantine the Great, when he ordered the pillaging and the tearing down of some temples. Under his reign ordinary Christians began to vandalise pagan temples and this persecution had proceeded after a period of persecution of Christians in the Empire. From 361 until 375, paganism was relatively tolerated, three Emperors - Gratian, Valentinian II and Theodosius I - came under the influence of the Bishop of Milan - Ambrose. At his suggestion, state policies were reinstituted. 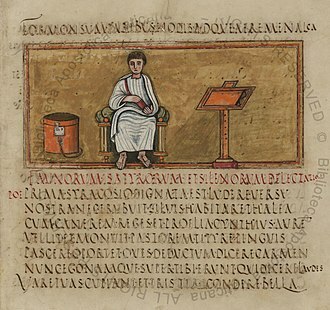 As a penitent under the care of Ambrose, Theodosius was influenced to issue the Theodocian Decrees of 391, Gratian removed the Altar of Victory for the second time. The Vestal Virgins were disbanded, and access to Pagan temples was prohibited, earlier in his reign he had prohibited the construction of new temples but tolerated the practice of pagan sacrifices. According to Church historians writing after his death, Constantine converted to Christianity and was baptised on his deathbed, Constantine was baptised by Pope Sylvester I.
Constantine would sporadically prohibit public sacrifice and close pagan temples, very little pressure, was put on individual pagans, when Constantine dedicated Constantinople, two Neoplatonists friends - Sopater and Praetextus - were present. A year and a later, on Monday 11 May 330, when the festival of Saint Mocius was celebrated. Although by now Constantine openly supported Christianity, the city still offered room to pagan cults, there were shrines for the Dioscuri, the Acropolis, with its ancient pagan temples, was left as it was. As for worshipping the emperor, Constantines mausoleum gave him a Christ-like status, his tomb was set amid 12 monuments, Constantine had continued to engage in pagan rituals. The emperor still claimed to be a supernatural being, although the form of this personality cult had become Christian. According to some authors, the issuing of the Edict of Milan and he continued to pay his public honors to the Sun, until 325, on coins that showed him jointly with Sol Invictus, whereas his coins showed the Chi-Rho sign. Aeacus was a mythological king of the island of Aegina in the Saronic Gulf. He was the father of Peleus and Phocus and was the grandfather of Achilles, Aeacus was the son of Zeus and Aegina, a daughter of the river-god Asopus. He was born on the island of Oenone or Oenopia, where Aegina had been carried by Zeus to secure her from the anger of her parents, according to some accounts, Aeacus was a son of Zeus and Europa. Afterward, Zeus restored the population by changing the ants into men, while he reigned in Aegina, Aeacus was renowned in all Greece for his justice and piety, and was frequently called upon to settle disputes not only among men, but even among the gods themselves. Aeacus prayed, and as a result, the drought ceased, Aeacus was believed in times to be buried under the altar of this sacred enclosure. A legend preserved in Pindar relates that Apollo and Poseidon took Aeacus as their assistant in building the walls of Troy, Apollo prophesied that Troy would fall at the hands of Aeacuss descendants, the Aeacidae. Aeacus was believed by the Aeginetans to have surrounded their island with high cliffs in order to protect it against pirates, several other incidents connected to the story of Aeacus are mentioned by Ovid. 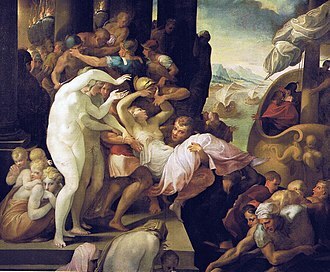 After his death, Aeacus became one of the three judges in Hades and, according to Plato, was concerned with the shades of Europeans upon their arrival to the underworld. In works of art he was depicted bearing a sceptre and the keys of Hades, Aeacus had sanctuaries in both Athens and in Aegina, and the Aeginetans regarded him as the tutelary deity of their island by celebrating the Aeacea in his honor. In The Frogs by Aristophanes, Dionysus descends to Hades and proclaims himself to be Heracles, lamenting the fact that Heracles had stolen Cerberus, sentences Dionysus to Acheron to be tormented by the hounds of Cocytus, the Echidna, the Tartesian eel, and Tithrasian Gorgons. 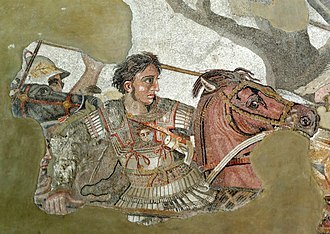 Alexander the Great traced his ancestry to Aeacus and this article incorporates text from a publication now in the public domain, William, ed. article name needed. According to Anthony Snodgrass, the Archaic period in ancient Greece was bounded by two revolutions in the Greek world. The Archaic period saw developments in Greek politics, international relations, warfare and it laid the groundwork for the Classical period, both politically and culturally. The word archaic derives from the Greek word archaios, which means old and it refers to the period in ancient Greek history before the classical. The Archaic period was considered to have been less important and historically interesting than the classical period. 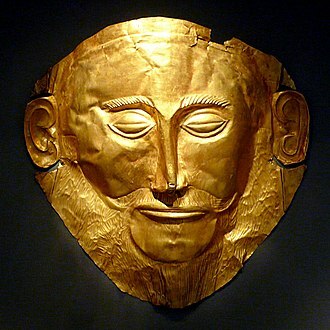 More recently, Archaic Greece has come to be studied for its own achievements, with this reassessment of the significance of the Archaic period, some scholars have objected to the term archaic, due to its connotations in English of being primitive and outdated. No term which has suggested to replace it has gained widespread currency, however. Much of our evidence about the period of ancient Greece comes from written histories. By contrast, we have no evidence from the Archaic period. We have written accounts of life in the period in the form of poetry, and epigraphical evidence, including parts of law codes, inscriptions on votive offerings, none of this evidence is in the quantity for which we have it in the classical period. What is lacking in evidence, however, is made up for in the rich archaeological evidence from the Archaic Greek world. Indeed, where much of our knowledge of classical Greek art comes from Roman copies, other sources for the period are the traditions recorded by Greek writers such as Herodotus. However, these traditions are not part of any form of history as we would recognise it today, Herodotus does not even record any dates before 480 BC. Politically, the Archaic period saw the development of the polis as the predominant unit of political organisation, many cities throughout Greece came under the rule of autocratic leaders, called tyrants. The period saw the development of law and systems of communal decision-making, with the earliest evidence for law codes, by the end of the Archaic period, both the Athenian and Spartan constitutions seem to have developed into their classical forms. The sanctuary of Artemis at Brauron is an early sacred site on the eastern coast of Attica near the Aegean Sea in a small inlet. The inlet has silted up since ancient times, pushing the current shoreline farther from the site, occupation ceased in the LHIIIb period, and the acropolis was never significantly resettled after this time. There is a gap in the occupation of the site from LHIIIb until the 8th century BCE, Brauron was one of the twelve ancient settlements of Attica prior to the synoikismos of Theseus, who unified them with Athens. The tyrant Pisistratus was Brauronian by birth, and he is credited with transferring the cult to the Acropolis, thus establishing it on the statewide rather than local level. The sanctuary contained a temple of Artemis, a unique stone bridge, cave shrines, a sacred spring. 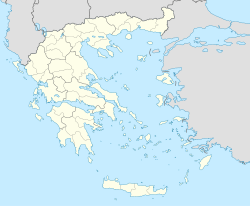 The unfortified site continued in use until tensions between the Athenians and the Macedonians the 3rd century BCE caused it to be abandoned, after that time, no archaeologically significant activity occurred at the site until the erection of a small church in the 6th century CE. Votive dedications at the sanctuary include a number of statues of children of both sexes, as well as many items pertaining to feminine life, such as jewelry boxes. Large numbers of miniature kraters have been recovered from the site, the Archaeological Museum of Brauron — located around a small hill 330 m to the ESE — contains an extensive and important collection of finds from the site throughout its period of use. 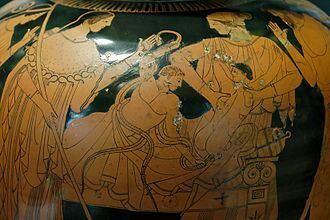 As the Greek fleet was preparing to sail to Troy to force the return of Helen, while there, king Agamemnon killed a stag sacred to the goddess Artemis. The enraged deity caused a contrary wind and eventually forced the king to agree to sacrifice his daughter Iphigeneia in order to ensure a favorable wind for the Greek fleet, and in the future mortals shall sing hymns to the goddess Artemis Tauropolos. And set up this law, whenever the people keep the festival as a payment of your sacrifice, hold a sword at a mans throat and draw blood, I command you to send forth these Greek women from the ground due to their correct intentions. 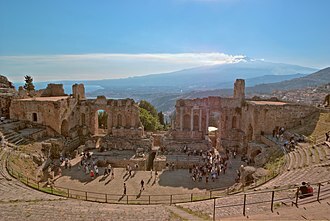 The poet asserts a close connection between the sanctuary of Artemis Tauropolos at Halai and the Sanctuary at Brauron, where Iphigenia is to receive honors in the cult of Artemis. As is often the case, there were multiple competing versions of the relevant myths, cult activity is known from the 8th century BCE forward from dedications in the sacred spring, and a temple was built in the 6th century BCE. In the 420s BCE, there was a period of significant architectural activity at the site, including the addition of the Π-shaped stoa, the bridge and reconstruction work on the temple. Since Artemis was connected in myth to both plague and healing — as was her brother Apollo — it may be that this activity was taken as a result of the plague that struck Athens in this period. The unfortified site continued in use until the 3rd century BCE and they say that she left the image here and went herself to Athens and later to Argos. In 1945, Ioannes Papadimitriou began excavating this site, professor Ch. A cella or naos is the inner chamber of a temple in classical architecture, or a shop facing the street in domestic Roman architecture, such as a domus. Its enclosure within walls has given rise to extended meanings, of a hermits or monks cell, in Ancient Greek and Roman temples the cella is a room at the centre of the building, usually containing a cult image or statue representing the particular deity venerated in the temple. In addition the cella may contain a table or plinth to receive votive offerings such as statues and semi-precious stones, helmets and arrow heads, swords. The accumulated offerings made Greek and Roman temples virtual treasuries, the cella is typically a simple, rectangular room with a door or open entrance at the front behind a colonnaded portico facade. In larger temples, the cella was divided by two colonnades into a central nave flanked by two aisles. A cella may contain an adyton, an inner area restricted to access by the priests—in religions that had a consecrated priesthood—or by the temple guard. 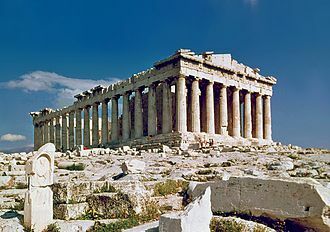 With very few exceptions Greek buildings were of a design that placed the cella in the center of the plan, such as the Parthenon. The Romans favoured pseudoperipteral buildings with a portico offsetting the cella to the rear, the pseudoperipteral plan uses engaged columns embedded along the side and rear walls of the cella. The Temple of Venus and Roma built by Hadrian in Rome had two cellae arranged back-to-back enclosed by a single outer peristyle, according to Vitruvius, the Etruscan type of temples had three cellae, side by side, conjoined by a double row of columns on the facade. The cella, called the naos, holds many box-like shrines, the Greek word naos has been extended by archaeologists to describe the central room of the pyramids. Towards the end of the Old Kingdom, naos construction went from being subterranean to being directly into the pyramid. The naos was surrounded by different paths and rooms, many used to confuse and divert thieves. In early Christian and Byzantine architecture, the cella or naos is an area at the centre of the reserved for performing the liturgy. 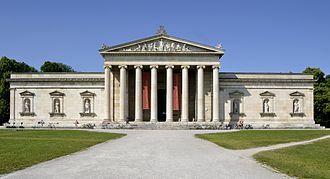 The Glyptothek is a museum in Munich, which was commissioned by the Bavarian King Ludwig I to house his collection of Greek and Roman sculptures. It was designed by Leo von Klenze in the Neoclassical style, today the museum is a part of the Kunstareal. He envisioned a German Athens, in which the ancient Greek culture would be remembered, colorful frescoes and stuccos made by distinguished artists such as Peter von Cornelius, Clemens von Zimmermann, and Wilhelm von Kaulbach adorned the walls of the museum. In the few years between 1806 and the opening of the museum in 1830, Ludwig completed a collection of Greek. Through his agents, he managed to such pieces as the Medusa Rondanini, the Barberini Faun, and, in 1813. The museum was designed in the Classical Greek - Italian style, the portico is Ionic, and the outer walls contain niches, in which 18 original Roman and Greek sculptures stand, six on each wall. The thirteen rectangular, square or round rooms are arranged around a courtyard, in front of the vestibule is the portico of twelve Ionic columns. The overlying gabled includes a group of Johann Martin von Wagner represents Athena as protector of the plastic arts, the exterior walls are adorned with sculptures in niches, while the windows are open to the interior courtyard. The sculptures represent mythical or historical representatives of the arts, these are in the front of the Königsplatz Daedalus, Hadrian, Phidias, the museum was originally built completely out of marble. However, during World War II the museum was bombed, the walls from the interior are composed of red brick and painted with a light plaster. The Glyptothek contains sculptures dating from the age to the Roman era. Other notable sculptures and reliefs can be found here and this collection is complemented by the terracotta and bronze collections in the Staatliche Antikensammlung, which is located opposite the Glyptothek. Among the most famous sculptures covering Archaic Greece are the Munich Kouros, the Kouros of Tenea, of the latter, there are in fact two sets of similar sculptures at the Glyptothek. The ruins of the Temple of Apollo. Detail of the Aegina temple figures. Image from his "Trachten und Gebräuche der Neugriechen"
View of the platform of the temple, looking south across the stoa. Erasinos river near the temple of Artemis Brauronia. Labelled plan of the Sanctuary of Artemis. The entablature of the Hephaisteion (temple of Hephaistos) in Athens, showing geisa. Horizontal and raking geisa of the Ionic/Corinthian order on the Arch of Hadrian. The New Hermitage, St. Petersburg, Russia, was one of the first museums designed specifically to house art collections. A cult statue of the deified Augustus, disfigured by a Christian cross carved into the emperor's forehead. Ivory diptych of a priestess of Ceres, still in fully classical style, ca 400, which was defaced and thrown in a well at Montier-en-Der. This Etruscan antefix depicts the mythological character Silenus. Walters Art Museum, Baltimore. Etruscan antefix from Vulci, 1st century BCE. Etruscan antefix from Cerveteri, 6th century BCE. A gem-grade seal-stone (top) and its impression. The Athenian Treasury in Delphi has a typical distyle in antis design, with two antae framing two columns. Greek Temple of Apollo at Paestum with centrally located cella. The Maison Carrée at Nîmes with its cella offset behind the hexastyle portico.